We’ve been manufacturing Pop Up Stands in-house for the last nine years, and over that time we have developed a tried and tested method of quality checking to ensure every order exceeds the five-star standard our clients have come to expect from us. First and foremost, we always check and pre-flight our client’s artwork. We look in excruciating detail at every inch of the logo or branding to see if there is anything that could potentially hinder the quality of the pop up stand once it’s printed. Our specially trained graphic design team check for things like print resolution, image placement and anything else that looks like an unintentional part of the design that may have been previously overlooked. Any errors of queries our team pick up on are sent directly to the customer. If the client is happy to proceed and signs off the artwork, we move the pop up stand to print. If a client doesn’t have artwork at the time of purchasing a pop up stand, we offer a graphic design service where our team of talented graphic designers can create bespoke artwork for any of our pop up stands. If you are purchasing a custom made or bespoke pop up stand, our dedicated exhibition stand designer will create a 3D render of your display. If you have a certain sized floor space but are unsure of which pop up stand you like the best, our graphic design team can create renders of different pop up stands that will fit in your space. Artwork is checked again by our print specialists before they begin printing each pop up stand. 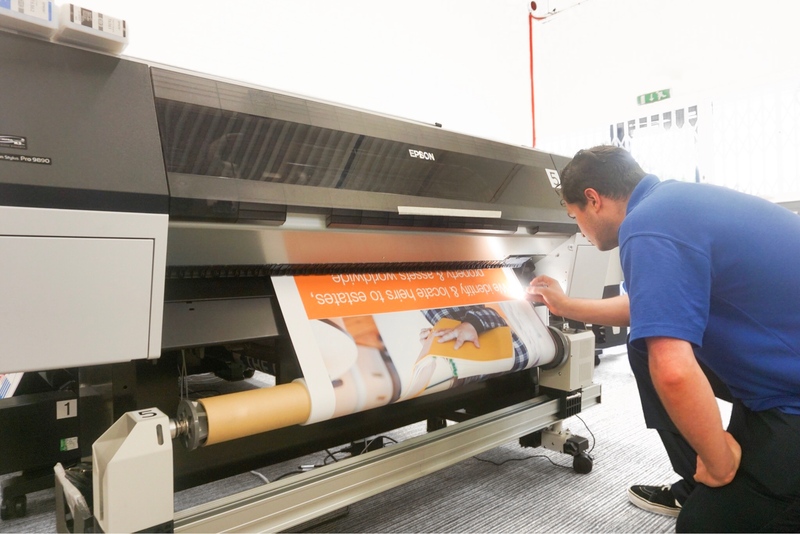 As the display is printed, our team execute spotlight checks whereby they examine the display panels as they come off the printer using a torch to highlight any potential errors. Once the print team are happy the panels are printed correctly, they pass the display on to our production team. Did you know: we use water-based, eco friendly inks and 100% PVC free, recycable polyester media to print our pop up stands. The first step we take when a pop up stand comes through to the production room from print is to laminate the panels. Laminating the display media used on pop up stands increases the longevity of the product by creating a scratch and tear resistant layer of protection. As the panels are fed through the laminator, we continuously wipe the panels to minimise the risk of dust and other debris getting under the crystal matte laminate and creating unwanted lumps and bumps in the display. When the panels have been cut to size and fitted with magnetic tape, headers and kickers, the display is then test-built. We test-build every pop up stand to ensure that the hardware is fully functional, the print lines up correctly and that the overall display is up to scratch. During the test-build stage our production manager carefully inspects each pop up stand to check for any issues. When he is satisfied the display is up to scratch, he signs it off and the stand is carefully packed away ready for dispatch. Did you know: we expertly pack each pop up stand away with the panels placed in the order they are applied to the frame to make assembly extra easy for our customers. This rigorous quality checking routine is what sets us apart from other pop up stand suppliers. We check every product to ensure that what the customer receives is what we ourselves would expect. For more information on our pop up stands or graphic design service, please Contact Us or call us on 01733 511030.